Visual signalling (V/S) has been used by navies the world over for centuries. The origins and history of V/S, at a time when the Royal Australian Navy (RAN) is embracing new technologies and all that it promises for the future of naval communications, is worth reviewing as its continued use within the fleet faces an uncertain future. When Samuel Morse revolutionised signalling on land with the development of the Morse code and the introduction of the electro-magnetic recording telegraph in 1844, the wide possibilities of this system were quickly recognised by the Royal Navy (RN). Experiments and trials were subsequently carried out by Lieutenant (later Vice Admiral) Phillip Colomb, RN and Captain (later Colonel) Bolton of the East Suffolk Regiment, who developed their own simplified flashing light code and patented a flashing light signal system in about 1862. The RN introduced Colomb's system into service in 1867, with the complete Morse Code being adopted for flashing light purposes and inclusion in signal books in 1889. At the same time, other means of V/S were also being trialled and in around 1874, ships were first fitted with mechanical semaphore. This system, which had evolved from a French innovation, involved the use of a post fitted with mechanical arms that could be positioned to form various angles with the perpendicular to represent the letters of the alphabet. By 1880 it was realised that the position of the mechanical semaphore arms could just as well be replicated by signalmen using hand flags, and this new method of conducting short range semaphore was subsequently introduced. Left: An early mechanical semaphore in use at sea. Right: The Garden Island Signal Station, Sydney, circa 1913. Note the 'crank handle' mechanical semaphore visible in the background. Flag signalling too, continued to develop. In use by the Navy of England for centuries, and famously used by Vice Admiral Horatio Nelson prior to the Battle of Trafalgar to inspire his men, it had by the early 20th century evolved from some basic signals appearing in the Black Book of the Admiralty in the 1300s into an effective means of conveying manoeuvring instructions between ships. With the advent of steam propulsion, warships were able to function at increased speeds, perform complex manoeuvres known as steam tactics and operate in larger formations, generating a greater need to rapidly pass manoeuvring instructions. This increased dependence on V/S for manoeuvring, resulted in a nexus forming between ship's command elements and the signalmen who were responsible for conveying this information. From this point, V/S and tactical manoeuvring became inextricably linked, with signalmen developing a keen understanding of what later became known as fleetwork. 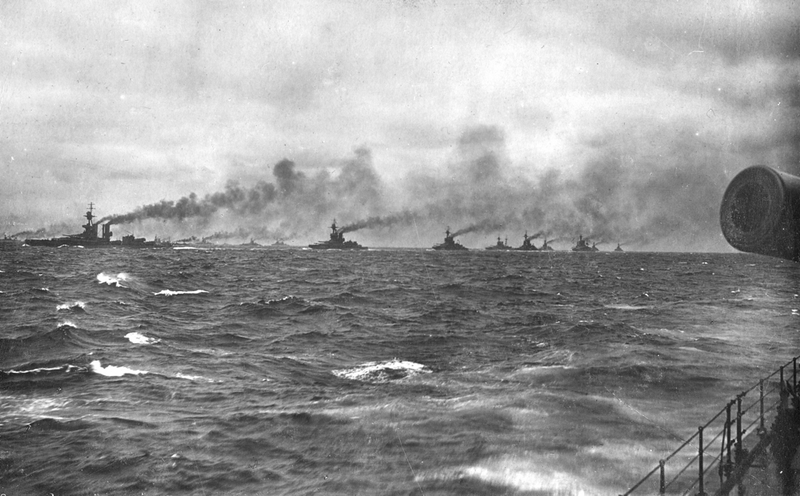 The Royal Navy Grand Fleet in formation at sea. Manoeuvring signals were passed from the Admiral to the ships in his fleet using a combination of visual signalling methods such as flaghoist and flashing light. In 1905 the emergence of wireless telegraphy (W/T) revolutionised naval warfare. Ships communications were no longer cut when out of V/S range and RN senior officers became convinced that wireless communication offered great possibilities. The enthusiasm shown for W/T over 100 years ago in many ways mirrors the enthusiasm shown today for email, text messaging and 'chat' services. Notwithstanding this fervour it did not prevent one naval officer submitting a post exercise report on the use of W/T that cautioned 'The working of W/T was most inefficient, not because it didn't work, but because of the enormous number of useless and obsolete messages transmitted'. It was also recognised that while V/S and cable communications were reasonably secure, wireless messages in plain language were not, and could be read by anyone with receiving equipment. Consequently, far from falling into decline, V/S continued to be used widely, even as W/T was further developed and cryptographic codes introduced. The developments being made by the RN in signalling during the late 19th and early 20th century coincided with the genesis of Australia's Navy. As such, the RN's signalling procedures, codes and equipment were quickly adopted by Australia's colonial naval forces, with the first School of Signalling being established at Williamstown, Victoria in 1900. The commissioning of the boys training ship HMAS Tingira in 1912 served as an additional means of training young boys for service in the fleet as signalmen. Many of them became proficient in signalling before leaving Tingira and were subsequently rated boy signalmen. The School of Signalling later relocated to its current site at HMAS Cerberus in 1913 and by the time the 'Fleet Unit' arrived in Sydney on 4 October 1913 the RAN was already proficient in most aspects of signalling and fleetwork. The following year the RAN was relying heavily on these skills during its first wartime operations. L-R: Tingira boys George French, David Mort and Richard Lincey were just some of those who became proficient at signalling while under training in HMAS Tingira. Throughout World War I, both V/S and W/T proved invaluable. Both RN and RAN signalmen had by now attained a high degree of efficiency and speed in signalling, and V/S had become the normal method used for tactical manoeuvring. It also provided a vital means of communicating with merchant ships using the 'International Code of Signals'. Although no RAN vessels participated in the Battle of Jutland in May 1916, many lessons in signalling flowed from this encounter. Poor visibility and battle damage impeded effective V/S during the action and ambiguity arose from instances of poor signal selection and ineffective enemy contact reporting. The RN was quick to review its V/S and manoeuvring procedures following the battle with a number of changes being swiftly implemented in September 1916. One of the most important changes came when W/T 'ceased to be a byline of torpedomen and became instead the departmental and administrative property of the Signals Branch'. 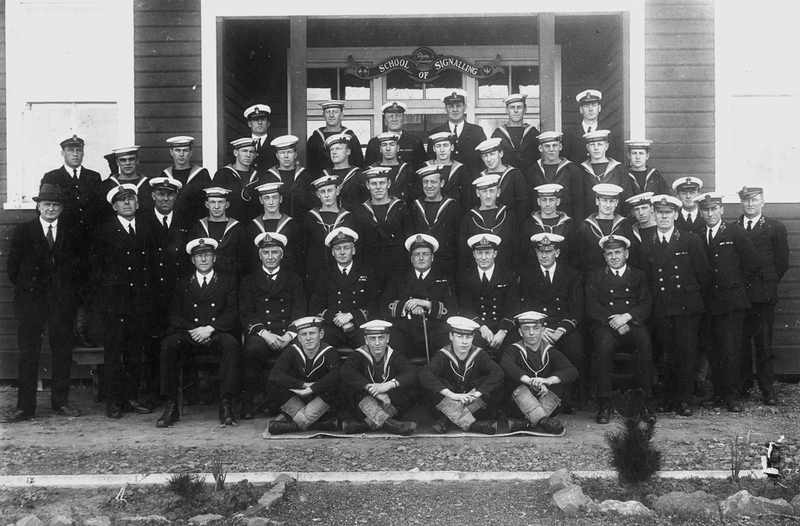 RAN School of Signals, Flinders Naval Depot, HMAS Cerberus, 1923. Technological advancements included the introduction of the hand held Aldis signalling light followed shortly after the war by the introduction of the ubiquitous Admiralty Pattern 3860A 10 inch signalling projector, used in all Commonwealth navies until superseded in 1986. In the lead up to World War II V/S changed little. Notwithstanding this, V/S and fleetwork were used extensively throughout the war in all theatres and in just about every facet of naval warfare imaginable. The application of V/S and fleetwork ranged from major surface actions to convoy work, amphibious assaults (notably D-Day), small boat work and clandestine operations, when the need for radio silence was paramount. Women also swelled the ranks of the signalman category following the institution of the Women's Royal Australian Naval Service in April 1941. Although not permitted to serve in ships, they performed valuable work manning facilities ashore, notably Port War Signal Stations and perfoming duties with the Navy's Examination Service. In the mid-1980s restrictions concerning women serving at sea were lifted and before long women were working alongside their male counterparts on flagdecks throughout the fleet. Following America's entry into the war, it did not take long for the RAN to begin operating with ships of the United States (US) Navy. Up until this point the RAN had used RN doctrine exclusively and new codes, signalling procedures and manoeuvring instructions had to be learnt by signals personnel. This was duly achieved and RAN units operated successfully as elements of the US Task Forces operating throughout the Pacific. When the British Pacific Fleet arrived in Australia in February 1945, its personnel had to learn the US manoeuvring and V/S procedures. They also had to familiarise themselves with the extensive use of Radio Telephony (R/T) used by the Americans to manoeuvre the large and widespread formations by voice over tactical communication nets. This successful integration of the Anglo-American fleets in the Pacific theatre contributed greatly to the close relationship that was maintained and developed after the war. Left: Signalman operating a Pattern 170A signalling projector in an RAN corvette during WWII. Right: HMAS Nepal fills the sky with bunting while making a signal by flaghoist. V/S continued to play its part right up until Victory over Japan day when HMAS Nizam received by flag hoist the signals 'Cease hostilities with Japan' and 'Splice the Mainbrace'. As the signals were being repeated by the Australian destroyer a kamikaze aircraft, intent on continuing the fight, was brought down over the fleet. The scene on Nizam's flag deck, with one signalman trying to hoist 'Splice the Mainbrace' while the other was hoisting 'Aircraft warning Flash Red' made for a memorable end to the second great conflict of the 20th century. Signalman carried out their duties in all climates. Here signalmen in HMAS Warramunga (I) man the flagdeck in freezing conditions during the Korean War. Following World War II the proliferation of signal traffic stemming from the rapid development in technology introduced new challenges for the naval war fighter. The sheer volume of information being transferred today between allies and coalition partners via a myriad of high tech circuits is astounding. This is often compounded by the absence of brevity which underpinned all V/S and W/T transmissions. As early as 1955, Captain Jack Broome, RN, wrote in his book 'Make a Signal:' 'Today information is poured, irrespective of distance, from brain to brain. The air is saturated with it. One day it will condense and paradoxically, form fog'. Clearly he was a man of vision, which prompts the question: has that fog already formed? Visual signalling is still taught in the RAN and is still used within the fleet, albeit at a much reduced rate. In its heyday it was favoured for its brevity: those who used it became adept at 'saying what they meant and meaning what they said'. Irrespective of the method used, the key to successful signalling has always been brevity. 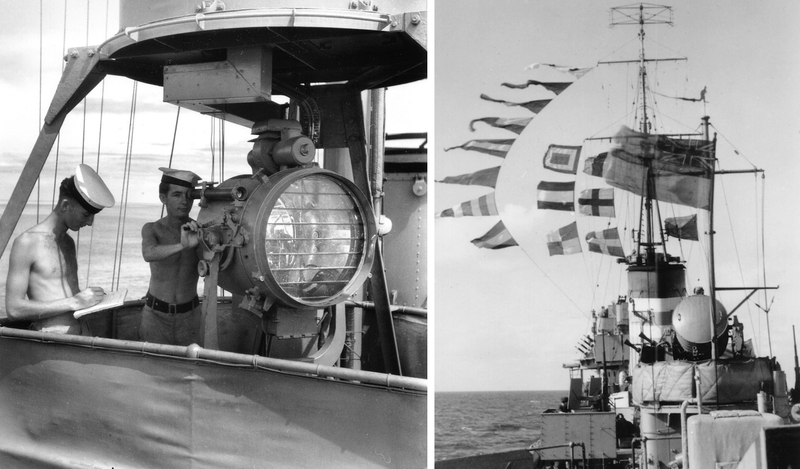 As for semaphore; the mechanical semaphore remained in use in larger ships of Commonwealth navies until finally withdrawn in 1943, while semaphore signalling using hand flags ceased to be used as a formal communications medium in the RAN on 24 November 2005. It is, however, still used by 'old hands' who have maintained their proficiency. Left: Leading Signalman Steve Bowden using a hand-held 5-inch signalling light in HMAS Sydney, circa 1990. Right: In 1986 the Admiralty Pattern 3860A 10-inch signalling projector was upgraded by Francis Searchlights, Bolton, UK and introduced throughout the RAN fleet. Today visual signalling is performed by members of the Communications & Information Systems Category. ↑ Captain Barrie Kent, 'Signal! - A History of Signalling in the Royal Navy', Hyden House Limited, Hampshire, 1993, p. 9. ↑ Kent, 'Signal! ', p. 10. ↑ Royal Navy, 'Admiralty Manual of Seamanship, Volume 1', HMSO, London, 1964, p. 348. ↑ Kent, 'Signal! ', p. 29. ↑ Captain Jack Broome DSC RN, 'Make a Signal', Puttnam, London, 1955, p. 23. ↑ Andrew Gordon, 'The Rules of the Game', Naval Institute Press, Annapolis, 1996, p. 506. ↑ Gordon, 'The Rules of the Game', p. 517. ↑ Gordon, 'The Rules of the Game', p. 507. ↑ LJ Lind & MA Payne, 'N Class', Naval Historical Society of Australia, Sydney, 1974, p. 152. ↑ Broome, 'Make a Signal', Preface. ↑ Kent, 'Signal! ', p. 12. ↑ Maritime Commander Australia, 'Semaphore as a formal fleet communications medium', MCAUST SAE/BAS 240157Z NOV 05.